Throughout our elective, one of the concepts we focused on was social accountability; how we could better our approach as medical students and as a university to improve medical outreach. Medical outreach plays an essential role in the pursuit of good public health. Not only is it important to educate the public on simple yet vital pieces of medical knowledge, it is a very effective way of inspiring the next generation to become tomorrow’s doctors. Underpinning medical outreach is the philosophy of social accountability in medical schools, a concept which describes the importance of medical schools catering to the health needs of their community, both in healthcare and education. At Imperial, student societies such as ICSM Vision do fantastic work in the local community and make valuable contributions to the applications of many aspiring medical students – in particular, those from less affluent backgrounds. One of the main barriers to organising big outreach events is logistics. Often, events need to recruit a large group of volunteers, advertise heavily and obtain a high number of well-paying sponsors. Furthermore, these events often require months of preparation from a committee. 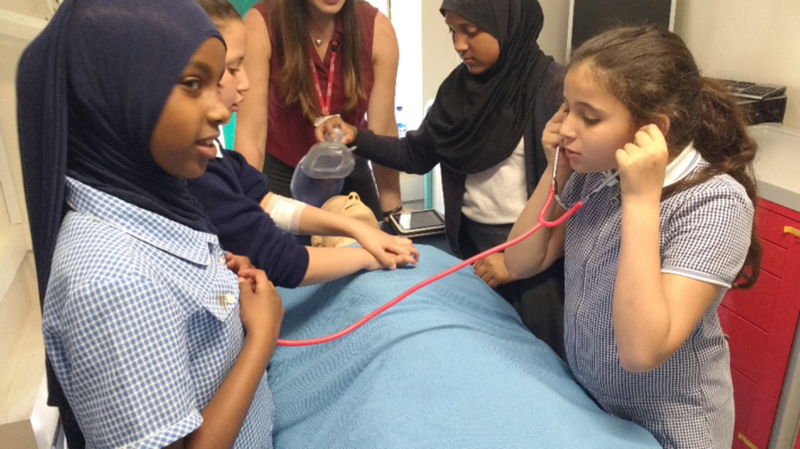 This is why we decided to bring medical outreach to a class of roughly 30 Year 6 pupils, specifically a class of pupils whose school was next door to Hammersmith Hospital. This was a perfect opportunity to organise a fun, stress-free and logistically simple school trip. Our team consisted of multiple members of staff and medical students. Together, we worked on organising two hours of interactive teaching for the pupils from the local Primary School. We organised a circuit of seven stations consisting of both theory and practical skills. These stations included taking a blood sample, CPR, ultrasound and simulated keyhole surgery. This was an opportunity to provide an exciting and memorable school trip for the pupils and to infuse them with an interest in the medical sciences. We are influenced heavily by those around us, especially when we are of primary school age; parents, teachers, friends and other adults all play a role in developing our interests and aspirations. The event was a definite success. The pupils had an excellent time and were extremely engaged throughout. It was very clear many had outstanding scientific brains and were able to ask many thought-provoking questions throughout the day. Running the stations was also very enjoyable and the medical students found it very rewarding. Medical students often find themselves questioning their usefulness in healthcare settings and events like this truly help affirm their value to themselves. Logistically, everything was very straightforward, and the school employed all the necessary precautions with regards to travelling on school trips. Large clinical skills labs are well suited to events like this and the staff working there said they were happy to run similar events in the future. We believe that outreach events of this kind are simple to run, socially accountable and hugely beneficial to the participants, both school pupils and students. The school was very happy with how everything went and wishes it to become an annual event. We look forward to doing more collaborations in the future. Michael Du, Mohammed Said Noor and Alexander Harding are foundation year doctors and have recently graduated from Imperial College School of Medicine.